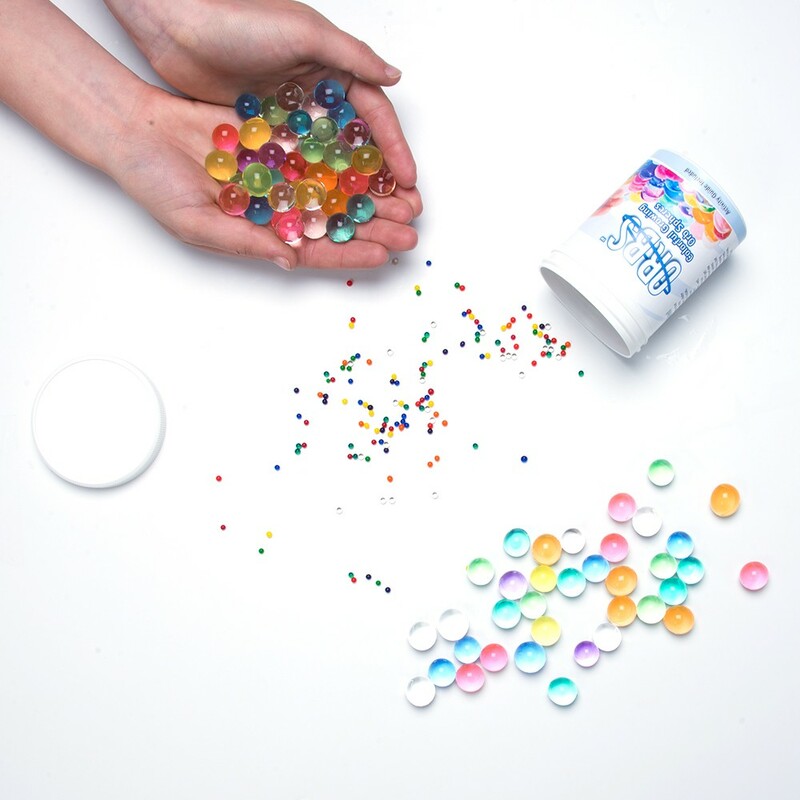 Program 43: Polymer Fun…Orbs, Flubber & Slime! I started our program by chatting with my scientists about polymers… Polymers can be found just about everywhere – in places you might not even have realized. They are in natural products like wool and silk (among many others), and then also in many man-made synthetic materials like nylon and rubber. Even the double-helix strand of DNA is a form of a polymer known as a “biopolymer.” But what exactly is a polymer? We also discussed how polymers can be both “good” and “bad.” Polymer products (like water bottles) can be cheap, durable, and convenient. But sometimes polymers can do some harm (taking over landfills because they aren’t biodegradable, being accidentally ingested by animals, etc.). I reminded my scientists it’s always good to investigate and know all sides to a story and to keep an open mind when learning about anything. I gave each scientist a cup with 5 different-colored beads in it, and also a mini-cup with 5 like-colored orbs fully grown (which I prepped the day before; there’s no danger to letting the orbs sit in excess water for any period of time). The kids could see just how much water the polymer orbs took in and how large they grew. I asked them to add water to the tiny, unsaturated beads so they could watch their rate of absorption over the course of our 1-hour program. We also had some fun with the fully-grown clear orb in particular. Because of its concave shape, if you roll the clear orb over any tiny printed materials (for example), it will act as a magnifying glass! Food coloring (optional); WARNING: food coloring will stain clothing/carpets, so if this is a concern, try something fun like glitter or sequins as an add-in for the flubber! STEP 1. Pour the glue into a mixing bowl. STEP 2. Add the water. Stir until combined. You should get a smooth, milky white liquid. FINAL STEP. Pour in the liquid starch. You can start by stirring with a spoon, but pretty quickly you’ll realize that the best way to mix is by using your hands. You need to get in there and do a lot of good squeezing and smooshing, to make sure that all of that liquid starch comes in contact with as much of the glue as possible. In our recipe, the glue contains our polymers, and the starch is what will link all of those polymers together to form our gooey substance. Some of our scientists LOVED this phase, and others couldn’t stop talking about how gross it was (haha). [REMINDER: Food coloring will stain, so if your goo will be traveling around the room, it’s best if you wear protective smocks or protect your floor/table surfaces.] You may find there’s some liquid starch left over in the bottom of the bowl – that’s okay! It just means that all of your glue polymers have already been linked by liquid starch and the rest of the starch is just excess and unnecessary. TIP: If you plan on saving your flubber to play with on another day, you may find that the texture changes a bit. Simply add a little more liquid starch, squeeze and smoosh, and then when the flubber stops absorbing starch you know your flubber is as good as new! The reason I chose flubber for our goo experiment was that you can actually blow reusable bubbles with flubber! It takes a little practice, but with the right technique, you can blow a REALLY large bubble, pop it, and start all over again using just a simple drinking straw! We had some scientists who used the table surface to support the giant bubbles they were blowing (very creative!). As you can see, the above recipe is very similar to our flubber recipe, but with one striking difference – the addition of “thermochromic pigment.” The pigment reacts to changes in temperature, most noticeably heat. Even when the pigment is just in its bag, you can touch the blue pigment, and it will turn white with the heat from your fingers. When I made my test batch of slime, I took my cues from the Left-Brain-Craft-Brain blog post (linked above to the experiment title) and used yellow food coloring during the creation of my slime. Thus, my final slime (in a resting state) was a turquoise blue, but when hot, turned a nice yellow. Also, if exposed to extreme cold (like a gel pack from the freezer), it turned a very deep blue. Mix the glue and water together in a bowl. Add the food color of your choice. NEW STEP! This is when you (carefully) mix in the pigment. It will take a while to combine, so you need to be careful when stirring or you’ll have pigment powder flying out of the bowl. But slow and steady wins the race with this one! You should have a smooth blue liquid when all the powder is combined. Add the liquid starch and stir. At some point, you will need to get in there with your hands and squeeze until all of the glue has combined with as much of the liquid starch as it needs. The trickiest part of this experiment was figuring out how to allow the scientists to heat the slime enough to see a dramatic color change. I tried hair dryers and heating pads with no good results, but I did figure out a safe way to pass around hot water while limiting the chance that a scientist could get burned. I used the mini cups from the Orb experiment (which come with snap-on lids), filled them half-way with hot water from my electric kettle, snapped on those lids, and then allowed the scientists to press the bottom of the cup to the top of their slime. It worked great! We ran out of time, so I was unable to pass around all of the gel packs I had borrowed from staff members for the cold reaction, but I encouraged the scientists to continue playing with the slime once they got home. This program was a terrific way for us to start off the summer here in Cheshire! Be sure to check out the fun video I made with some photos/clips from our program below. G3 in the Cheshire Citizen! The Mad Scientists Club takes place each month at Cheshire Public Library from 4:00-5:00 pm in the Mary Baldwin Room. Registration occurs about 2 weeks before the program. Look for flyers at the library, or call the library directly for more details!